I had to add the Kris Anka variant to my wishlist. 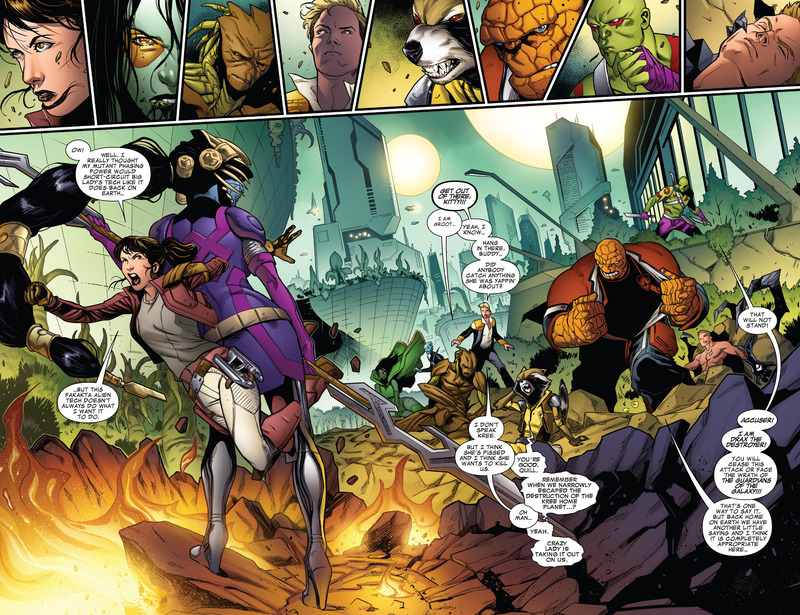 Issue opens with Hala’s reaction to having her home planet, Hala – the Kree’s homeworld. I imagine she has another name, but it makes it a tad complicated that her name is the same name as her home planet. I ‘get’ it is an homage but ooof, it isn’t great. 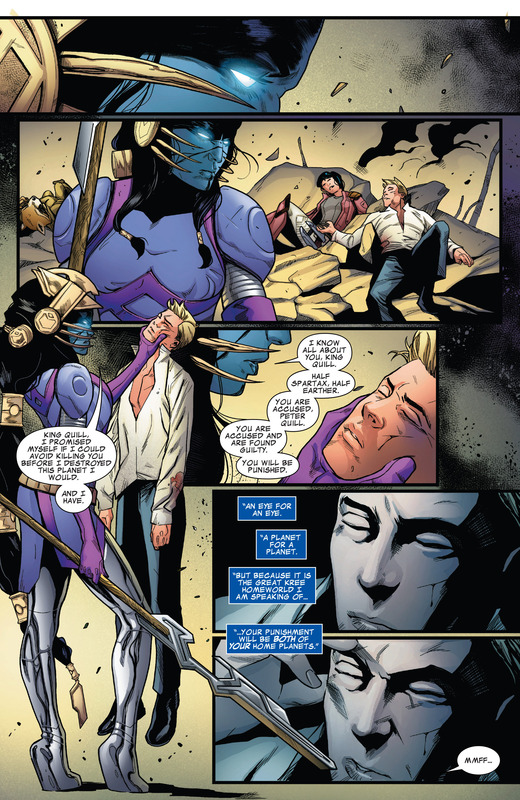 The Kree, it turns out, have been saving the galaxy for longer than anyone really knows. I always think of the Kree as being slightly better than the Skrulls and slightly worst than the Shi’ar. 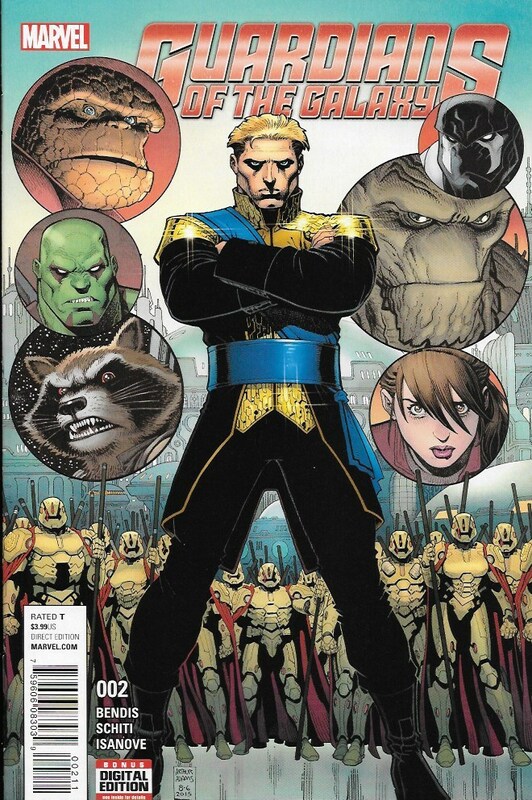 Also, that we wouldn’t have Inhumans, if it wasn’t for the Kree. Hala would have been there, when the planet exploded (during Black Vortex) but the Supreme Intelligence sent her away, to the far reaches of the galaxy. She is the last Accuser. She isn’t happy that Spartax survived (single-handedly by Kitty Pryde) and her planet didn’t. So she is now on Spartax, to make them pay. 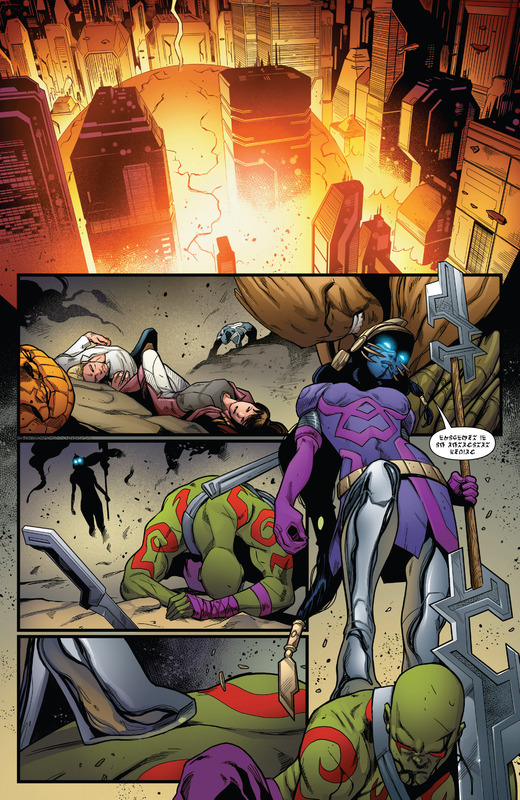 StarPryde is the first Guardian to attempt to take Hala down. Her phasing through Hala’s gun, didn’t short circuit it. 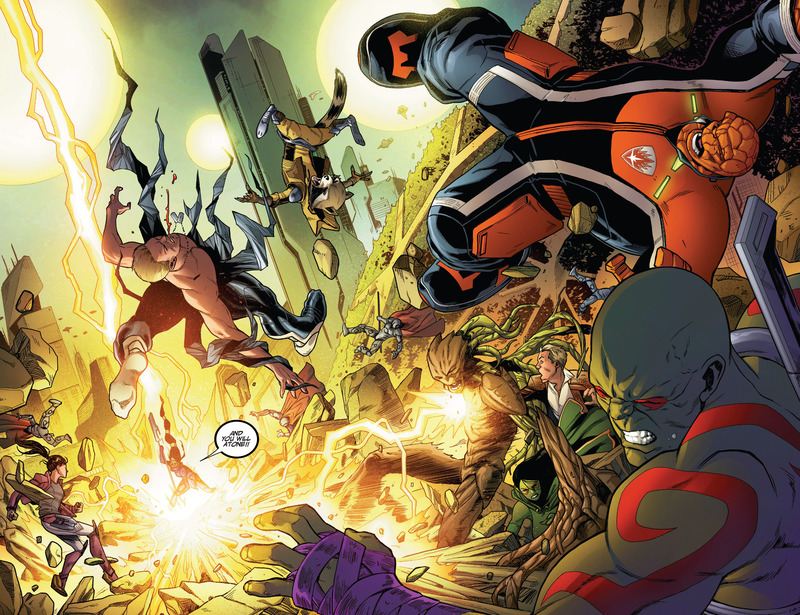 Groot is wounded, as he jumped in front of Quill – which I missed in the image before. Quill reveals that the giant multi-page narration slash monologue, was spoken (thought?) in Kree-ian(?) so no one present knows Hala’s motivations. Rocket understood everything and quickly states that she is mad that her homeworld was destroyed. 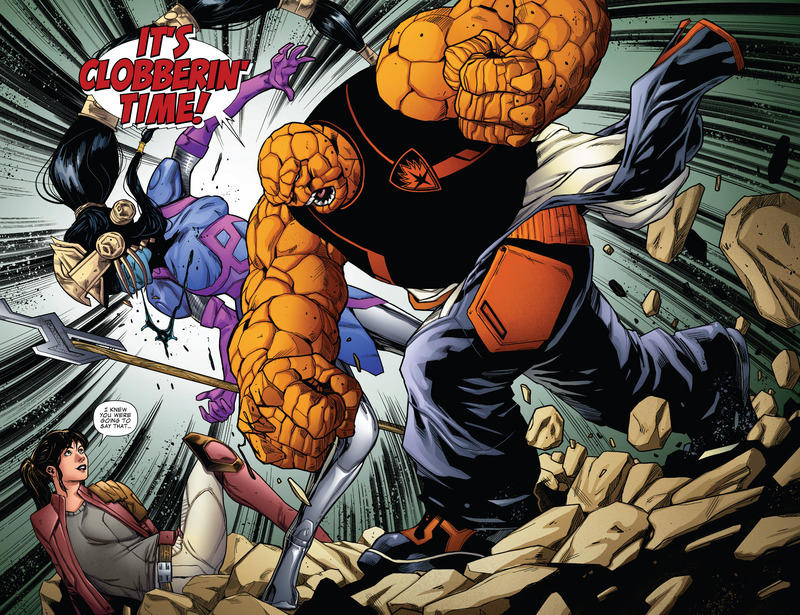 Drax yells a threat at Hala but Grimm has a fast way to say it . . .
Look how impress Pryde is with her new teammate! She does look good in that outfit. Grimm and Pryde have a great conversation about how it is okay for male hero characters to hit female villain characters, as someone has to stop the villain and genders shouldn’t come into the equation. Pryde didn’t like that Grimm called Hala, a broad. Which is one of my favorite words to describe a lady – as it sounds so old fashion but I have to stop using the term. I don’t want to be sexist. Rocket states that this reminds him of a dream he had, he’s having some deja vu. Pryde didn’t realize he dreams or that raccoons dream. 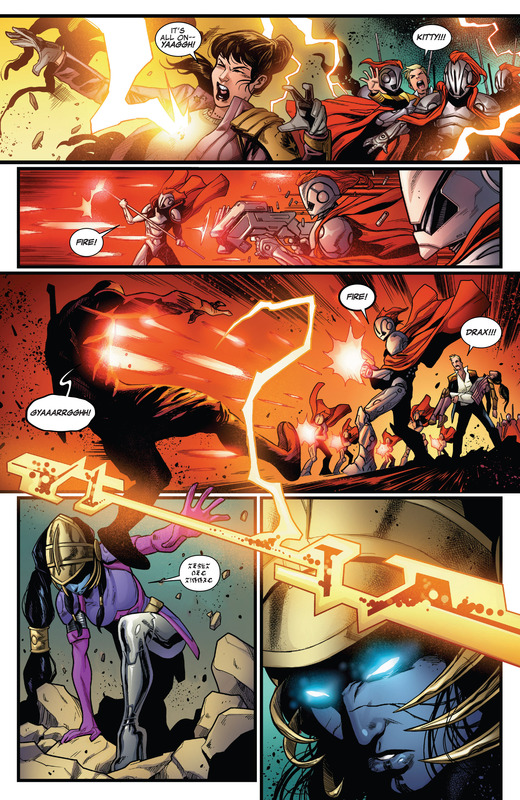 The Royal Brigade shows up, which annoys Quill as his friend, Groot, took the hit that one of them should have taken for him. 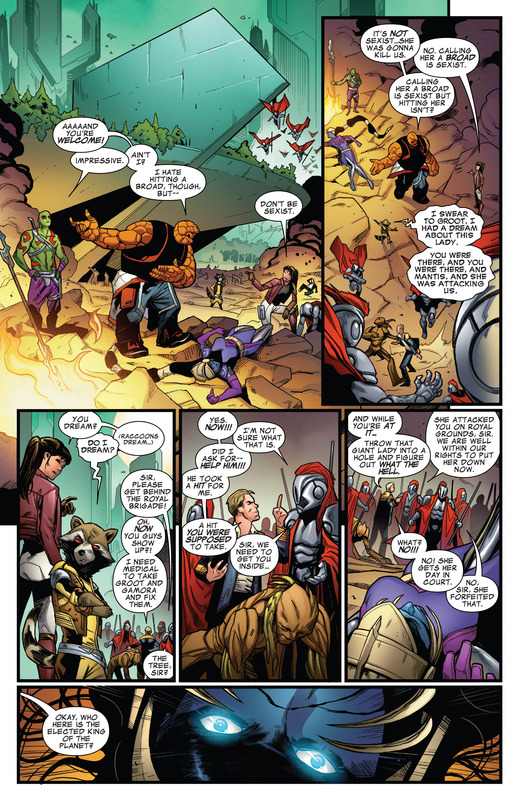 Quill orders the brigade to aid to Groot and Gamora. They are not sure if they can help Groot, he’s a tree – they don’t have tree doctors. Quill wants Lady Hala locked up, the brigade tells him that they have the right to kill her on the spot. I wonder if they actually could kill her? Quill says no to that idea, he wants her to see the inside of a courtroom – which seems like an odd thing to want to see. Are they going to go through the discovery process? Then maybe mediation, after that? Hala opens her eyes, so stuff is about to go down. Drax picks up the weapon Hala was using, he would like to keep the blaster staff thingie. Pryde tells him to put it down. The weapon, naturally and of course, goes off in his hands – causing a gigantic explosion. 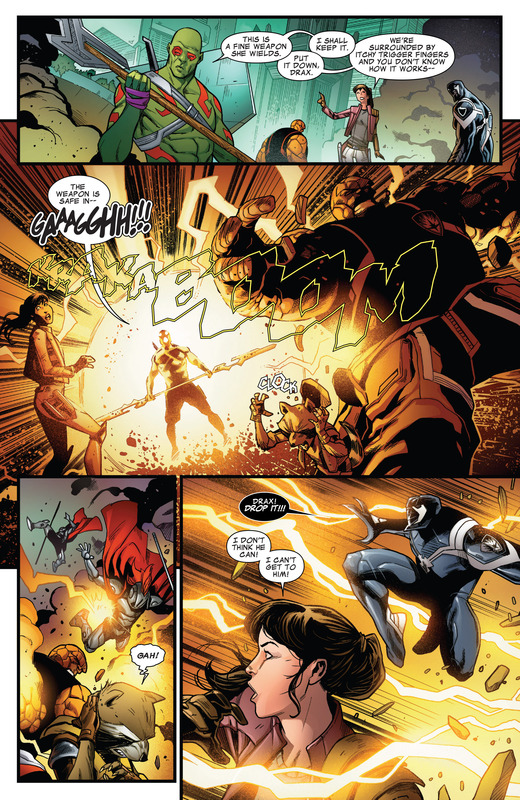 Pryde tries to phase through the lightning blasts but the energy waves still affect her. The brigade, the idiots that they are, open fire on Drax – forgetting that he is a friend to their president. He does drop the weapon. Hala gets to her feet, holding the weapon now. Hala causes a multi-block explosion – so now everyone is down. I do like the technique of not understanding her words. Hala walks over to Quill (nice that he landed near Pryde) and picks him up – by the neck! Hala starts speaking English, as she reveals that she knows who he is. She wants to destroy his world, before killing him. Since he has two worlds, she’s going to destroy Spartax AND Earth! Good luck with that second one, lady! Quill finally wakes up, in a shuttle floating away from Spartax. The issue ends with Spartax surrounded by a force field. I imagine, she doesn’t win – or if she does, that the Guardians were also taken off planet. Next issue’s cover promises Gamora v Drax, I suppose there can only be the one green team member – which is odd as they have been teammates for years now. Is it racist to say that they are both green? Should I be viewing them as just people?